iPad is a good choice for entertainment as we can do a lot of things on iPad like watching movies and playing games. It’s got a bigger screen than iPhone which makes it the perfect choice for movies and games. But iPad, just like other intelligent devices, suffers from some occasional hiccups. Sometimes iPad will freeze for no reason. This iPad frozen problem doesn’t happen much but it still bothers certain people. Here’s how you can tackle the iPad frozen problem. Below are several possible reasons that would cause the iPad frozen problem. 1. There are too many apps or data and they take up too much storage space on your iPad. 2. CPU overheating due to video playback or gaming. 3. Installed a faulty app. Now that you know what causes the iPad frozen problem, you can take measure to tackle this issue. Below are 3 ways for you to solve the iPad frozen problem. A lot of software problems can be fixed with a simple restart of your device. By rebooting the iPad, you will close the offending apps completely and clear the memory that iPad uses to run apps. To restart your iPad, press and hold the Sleep/Wake button and the Home button at the same time until the screen of your iPad turns dark. And then keep holding the Sleep/Wake button for a few seconds until you see the Apple logo on the screen. If your ipad freezes when running a specific app and it didn’t get better when you reopen the app or even restart your iPad, then there might be something wrong with that app. You should probably uninstall that app first and then install it again in App Store. Tap and hold the app you want to uninstall until it starts shaking and an X button appears in the upper left-hand corner of the app icon. Tap on it and on the following popup, tap Delete to delete the app from your iPhone. Note that by deleting the app, the data in the app will also be deleted. So if you have important data stored in the app, you’d better make a backup before you delete it from your iPad. If restarting and reinstalling the app didn’t fix the frozen iPad, you should try restoring your iPad to factory settings. Restoring your iPad could help erase all the available memory on your iPad. Use iTunes to erase your iPad and you can make a backup with iTunes before you do so. When your iPad froze, you might have to restore your iPad. And if you don’t have a backup of your iPad, you could lose all the data on your iPad. So you should probably back up your iPad in case of data lost. 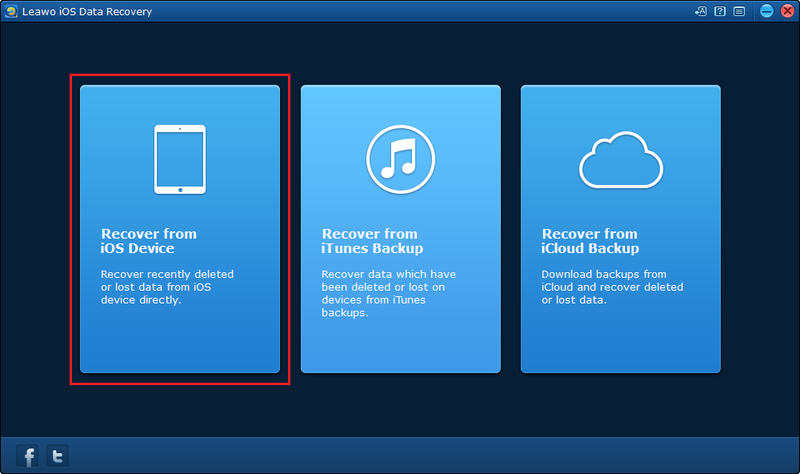 If you want to back up all the data on your iPad, you can go with iTunes or iCloud. But if you don’t need all the data on it, there’s a great choice for you. Leawo iOS Data Recovery is a practical data recovery program and at the same time a powerful data backup program which allows you to select specific files on your iPad to back up to computer. With Leawo iOS Data Recovery you can freely backup the files you need. 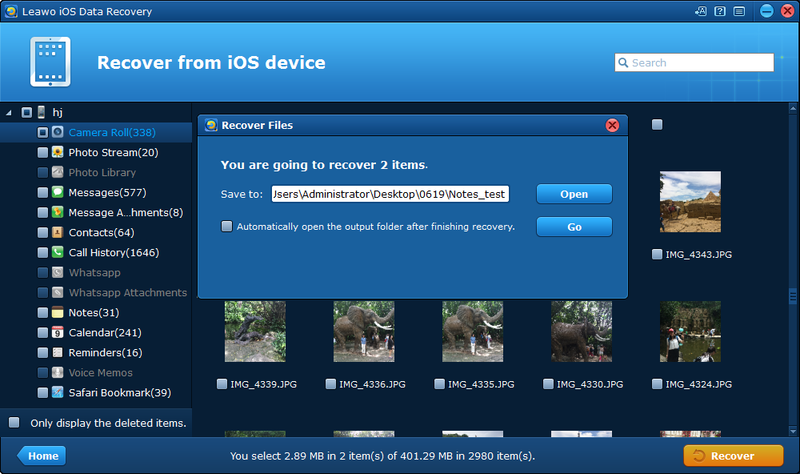 Follow the instrutions below to back up iPad with Leawo iOS Data Recovery. Step 1. Open the program and you will see 3 tabs, click on the one in the left which is Recover from iOS Device. Step 2. 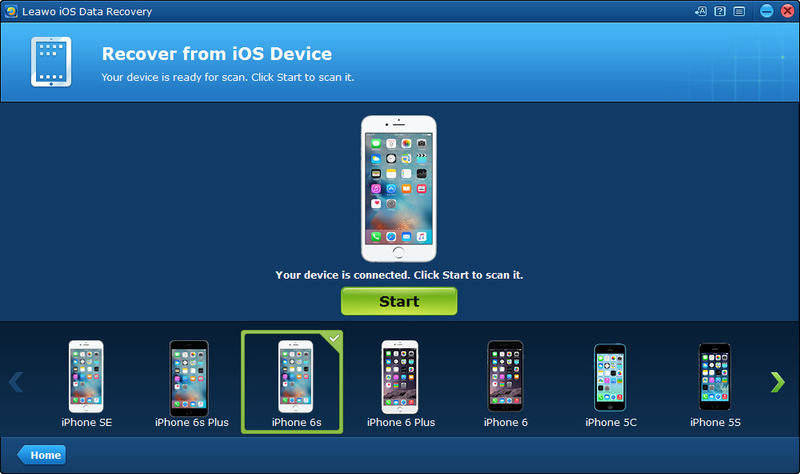 Next, you would see an iOS device list. Connect your iPad to your computer and the program would recognize your iPad automatically. When it recognizes your iPad, click the Start button and the program would start to scan your iPad. Step 3. When the scanning process completes, you would see different types of data on your iPad listed on the left of the interface. 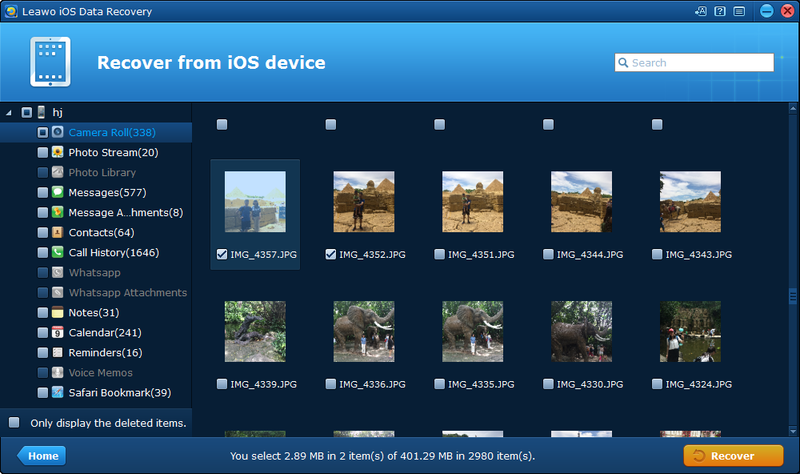 Select the files you want to back up to computer and click the Recover button in the bottom right-hand corner of the interface. Step 4. A popup would appear. Click Open button on the popup to select a folder on your computer to store the files you want to back up. And to start backing up your iPad, click Go button on the popup. The iPad frozen problem usually isn’t much of a big deal, give the above methods a try and your frozen iPad should be usable.